Cavium introduced its "LiquidSecurity" Hardware Security Module (HSM) Family that provides a FIPS 140-2 level 2 and 3 partitioned, centralized and elastic key management solution with the highest transaction/sec performance. 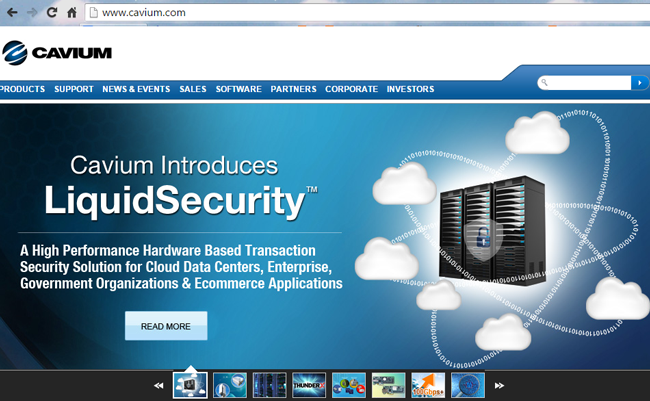 Cavium's LiquidSecurity Solution, which is available as a PCIe adapter family as well as an appliance, addresses the high performance security requirements for private key management and administration while also addressing elastic performance per virtual / network domain for the virtualized cloud environment. Major applications for this product family include Key Management as-a-Service, Database as-a-Service, Crypto as-a-service, Secure DNS, SaaS Applications, Virtual Private Clouds in the Public Cloud and Payment systems. Dual FIPS boundary - With the appliance version of the family a dual FIPS 140-2 boundary is also available that provides an added layer of security.